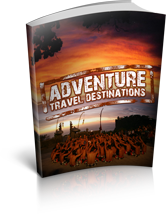 Best rates for Direct buys from Hotels and Tourism operators for the worlds best holiday adventure destinations. In addition to Direct deals with suppliers we do work with authentic and innovation adventure travel companies and tour operators. We are please to suggest Gap Adventures for your Gap planned Adventure Holidays around the world. In our pages we have hand picked a selection of tours from the best companies and added them in along with our a selection of hotels and local tourism operators in the destination. For the best deals it is still possible to get a great discount for last minute bookings. Even Gap will give a significant discount if a tour package is not sold and you book it just a few days before departure. You will see these opportunities by clicking on the links in these special pages. The same is true for hotels. In the good on days one got the best deal by booking well in advance and that is the proper reward. The industry is making moves to reward the early broker. But the fact is that if a room or package has not sold it will persist and all its potential revenue is lost for the supplier. Suppliers thus will make concessions to get the booking. We will be adding in alerts of special last minute options from several sources. Be sure to check them out. Most of the time the best rates are not based on just price, but instead on what you get. A Package that gives you what you want and all that you need can be more than a bargain.